While those two besties toured Radio City, the younger version besties traveled downtown to the Louis Vuitton Exhibit, Volez, Voguez, Voyagez, which has been running since October, and ends in just a few days. So, I know my timing on this isn’t the best if you’re in the NYC area and want to see in person, but I have some decent pictures to share! Let me just say, I learned so much from this exhibit, not to mention I was so happy my bestie & I went together! I reserved tickets for a guided tour, which were free, a few weeks in advance. I had read how popular it was, and knew it was crucial to have reserved tickets, as opposed to waiting in line. The tour was supposed to be about an hour, it was great when it started, but it was super crowded so we ended up sticking with the tour for about half the time, and then ditched it to roam around & take pics. Learning about The World of Louis Vuitton proved just how remarkable and timeless this brand truly is. Vuitton started as a woodworker, making sturdy, reliable, travel trunks for Europe’s elite. Slowly as times changed, and his son and grandson took over the business, it evolved to what we know as Louis Vuitton today. The layout of the exhibit chronicled the development of the brand in terms of travel, which is essentially how it continued to grow. 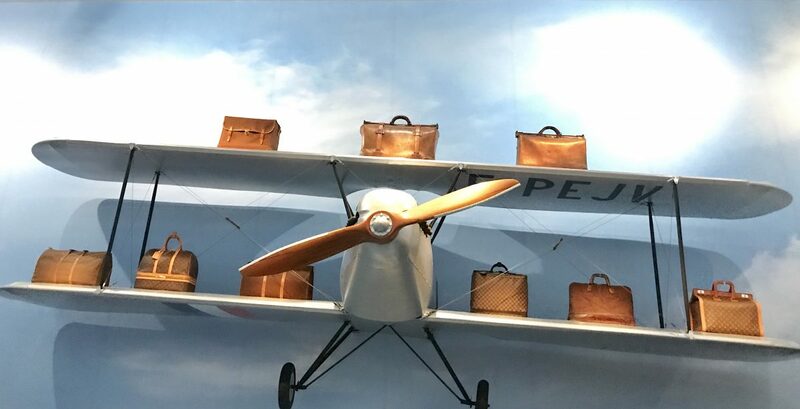 As the travel industry changed from train, to ship, to airplane you see how Vuitton’s work adapted. Media also played a huge role, Vuitton would make trunks, etc. for books, and then as records, and CDs came around, the brand adjusted its designs for those forms of media. All of the pieces were beautifully curated, from all of the traveling pieces to jewelry trunks & picnic baskets. Heather & I are obviously plotting to somehow obtain a LV picnic basket because…why not…? Seeing how the brand has evolved and grown with its variety of collaborations, statement making travel and every day pieces, was an awesome experience for me, & I’m so happy we went!